This spacious duplex apartment is situated in the popular Knocksallagh area of Greenisland. The property is close to local shops, schools, University of Ulster campus , public transport and Belfast is approximately 20 minutes by car. The property comprises, spacious lounge and dining area, separate kitchen with a range of high and low level units, two double bedrooms and bathroom with a three piece white suite. 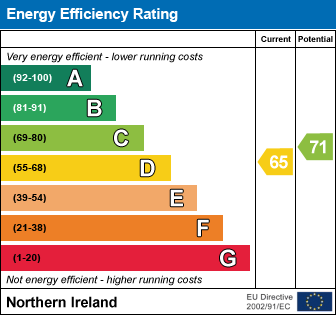 It further benefits from gas central heating, PVC double glazing and views over Belfast Lough. Knocksallagh Green is located off Knocksallagh Park, Greenisland. Check out the property I found on PropertyPal.com: 1H Knocksallagh Green, Greenisland, Carrickfergus BT38 8SR.